After steamrolling Brock Lesnar at UFC 121 to capture the heavyweight title, it’s understandable why Cain Velasquez is receiving the red carpet treatment. 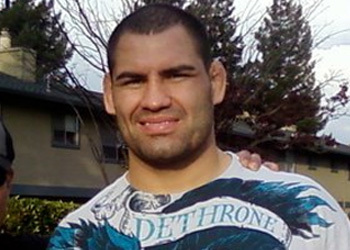 Although “Lopez Tonight” shunned him in favor of Tito Ortiz before last week’s blockbuster UFC 121 event, Cain and his Flavor of the Month status were finally asked to appear on the comedian’s show Monday night. Velasquez’s newfound fame started earlier in the day when he was an in-studio guest on TMZ.com. The Octagon’s reigning 265-pound king chatted with the insanely popular celebrity gossip website for nearly 30 minutes. That was apparently just a warm-up for the Mexican-American, as he saved his best for the Latino late night show. Velasquez revealed great charisma and personality with Lopez, even starring in a short skit to kick off the show.